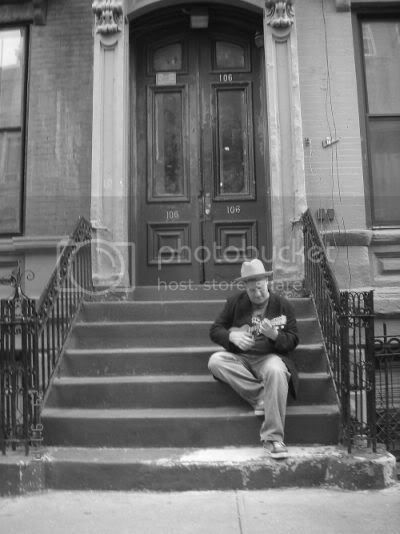 Not long returned from the frankly brilliant New York Ukulele Festival. What a blast it was, too. I managed to come home with sore fingers, a sore head and two more ukuleles than I’d left these shores with. I even made my public ukulele debut, with my inestimable colleague, friend and flaneur Stevie Morgan. It was a curious gig, very late at night indeed at a cabaret off First Avenue in Manhattan hosted by two men in drag, and there’s even video evidence for posterity. And for Stevie and I who had partaken of a few cold drinks that day leaving recollection hazy. Bear in mind that we’d written the song that very morning, having realised that we had no material whatsoever, were ill-prepared and not a little squiffy. In other news, Traveller’s Tree returns next month, and I’m just commencing the next travel book, too, which promises to be exhausting as most of it will be done on foot. Ho hum. Oh, and here’s me in my new hat – rather fetching, huh?